Disney's most beloved duo, Mickey and Minnie Mouse, are featured in this sweet scene by Thomas Kinkade Studios. On Kinkade's Sweetheart Bridge, Mickey and Minnie hold hands, surrounded by a vividly colorful cottage garden. The image is made entirely of acrylic, and the translucent properties allow natural light to illuminate the beautiful colors and detail. 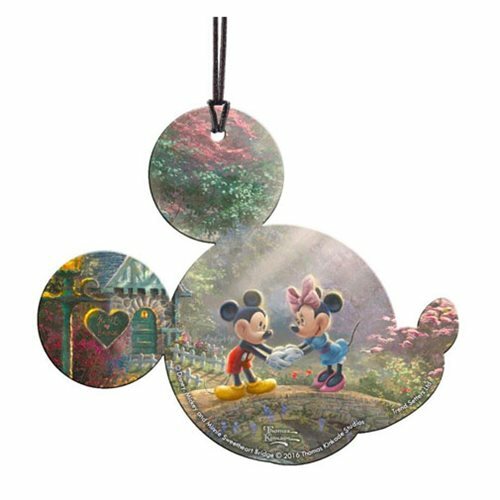 This Disney Mickey Mouse and Minnie Mouse Sweetheart Bridge Hanging Acrylic Print is shaped like Mickey's unmistakable silhouette and measures approximately 4-inches wide from ear to nose x 3 1/2-inches tall from chin to ear. Hanging string included.